We will hold the next Art the Arms Fair event in September 2019, and we want it to be even bigger and better than the last. We invite artists to contribute works of all kinds. We accept submissions from artists, performers, musicians, poets and creative people of all ages, nationalities and abilities. Whether you are a professional artist or not, if you have a great idea, we’d love to hear from you. other human costs of arms manufacture. Works do not have to be pictorial, and can represent feelings as well as events or actions. Art works can be in any medium. We will also be running a varied program of events. Please do contact us about performances of music, poetry, comedy and drama. We ask that each artist submit only one work. This can be a piece created especially for Art the Arms Fair or an existing artwork. We will sell art works or auction them to raise money for Campaign Against Arms Trade. There is no entry fee, and we are unable to pay artists for their work. In some cases, we may be able to support artists with bursaries. This could be to help with costs of making and delivering the work. We would like to keep bursaries for those who would otherwise be unable to realise their work. We will decide bursaries on a case-by-case basis, based on submitted applications. Art the Arms Fair 2019 opens to public in London on 2–13 September 2019. Firm dates and location to be confirmed. Art the Arms Fair is free to enter. 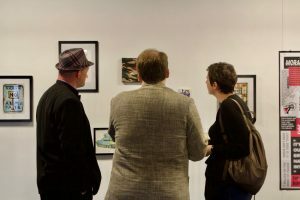 Artists may submit one work of art into the open call for 2019. Artists selected will be notified as soon as possible and 1 June at the latest. All art works, once donated, will be owned by Art the Arms Fair. Art the Arms Fair retains the right to determine if and how works are displayed in the show. All art works will be on sale to raise money for Campaign Against Arms Trade. We cannot pay artists for their works. Artists, performers and Art the Arms Fair staff are all volunteers. Artists will be in charge of delivery of art works to a location TBA in London in September 2019.